Non-GMO Project Shopping Guide – As it says on the can, this app provides consumers with a guide to shopping non-GMO. The Non-GMO Project’s Product Verification Program is a collaboration of a number of corporations whose aim is to help consumers make more informed choices in their purchases. The guide is completely free and is periodically updated with new contributions. Healthy Food, Allergens, GMOs & Nutrition Scanner – This Nutrition Scanner costs $3.99 and allows you to quickly determine exactly what is in the food you are shopping for. The scanner reads food labels and returns information on nutrition, ingredients additives and whether the product contains any GMOs. You don’t need to wonder which ingredients are dangerous, either, as the app has a caution rating for potentially undesirable contents. Buycott – If you are passionate about supporting companies that you believe have ethical practices, Buycott will help you stick to your principles. The app can trace food items back through the production chain, keeping you informed of every company involved in bringing the item to the supermarket shelf. The free app also provides contact details for each company, so you can voice your concerns or support for any given product. True Food – For conscientious consumers, True Food provides a real-time guide to shopping non-GMO. Every day the app will update with new alerts, news and tips on how to avoid GMO products, and where to find suitable alternatives. 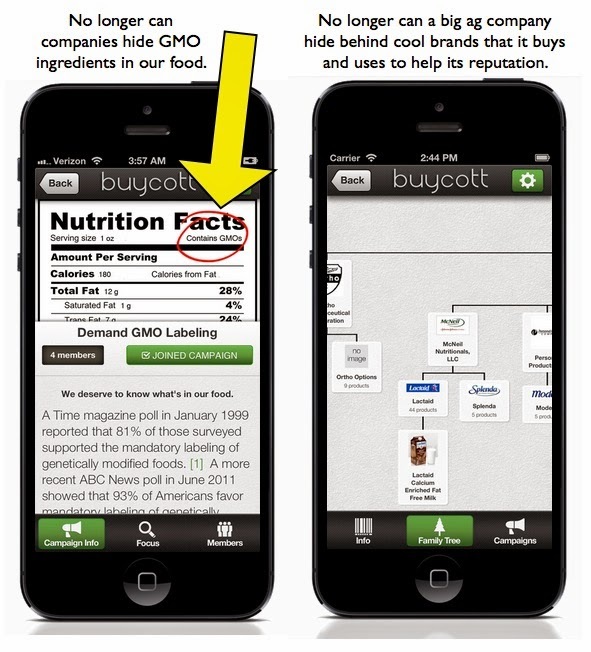 With over 70% of food products in the U.S. containing GMOs, this free app is definitely worth installing on your iPhone. ShopNoGMO – With 23 food categories that contain no GMOs, this free app gives you the power to decide which products you want to feed your family. The app is not limited to when you shop, however, as there is also a useful feature to help you avoid GMOs when dining out. Besides information on GMOs, there are helpful tips on sourcing organic foods and identifying other potentially unhealthy ingredients. GMO Checker – You can use this app to quickly identify products that are organic, vegan, gluten free and GMO free. GMO Checker uses a simple search function, which returns results with a color-coded key that tells you whether the product contains ingredients from the category list. While the app has a simple interface, it does cost $3.99, so it is not the cheapest option on the market. ipiit, The Food Ambassador – ipiit is a completely collaborative app with a database that is constantly growing due, in part, to user contributions. The database contains over 210,000 food products, with information on Gluten, Lactose, HFCS, GMO and much more. Users can set up their own preferences, making it easier to find the foods that match your needs. Rating foods on this free app will help keep the community informed so everyone can share in promoting healthier food choices. Chemical Maze – Whether you are concerned about what’s in your food, cosmetics or pet products, Chemical Maze will help keep you informed. You can filter results by category, effects, origin or symptoms, depending on what you want to find out about a product. This is the free addition of the app, however, there is also a paid edition with added features. Barcode and PLU Label Reader – Although this app is a Barcode and PLU reader, you have to manually enter the codes. With that said, the app does provide a lot of useful information that will help you purchase the healthiest products and avoid GMOs. Barcode and PLU Label Reader costs $1.99 and has a 4+ user rating on the iTunes store. Fruit Checker – A PLU label reader for fruits and vegetables, Fruit Checker will confirm whether products are certified organic, conventionally grown or genetically modified. In some cases the app will tell you where the product was grown, too. The app is useful, but limited for the price-tag of $0.99.